Stanislaus County Safety Officer David Becker … will present tips instrumental to surviving a potential zombie apocalypse before allowing the teenagers to assemble safety kits themselves. From water bottles to glow sticks, surgical masks to hand wipes, teenagers will choose life saving tools to keep on hand in the case that an unexpected disaster should strike. While the approach is light hearted, at the core of the library’s mission is a serious message about the importance of preparation and communication prior to a catastrophe. Notice a pattern? Virtually all of the skills taught are essentially short-term survival skills: what to pack in your to-go bag, how to use weapons, etc. These skills are fine for getting you through the first few weeks. 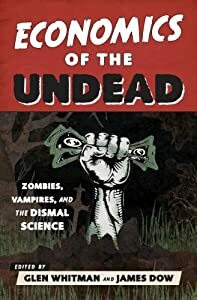 But as Jim Dow argues in Chapter 3 of Economics of the Undead, “Packing for the Zombie Apocalypse,” you also have to think long-term. Eventually, your duct tape, ammunition, glow sticks, and hand wipes will run out. If civilization has collapsed in the meantime, you need to think about how you’ll support yourself in the post-apocalyptic economy. There’s nothing wrong with packing stuff, but as Jim argues, what matters more in the long run is what you’ve packed in your head. Do you have a skill that you can use to engage in trade with the other survivors? It’s unrealistic to think you can be totally self-sufficient, which means you’ll need something to offer others that they will value. Do you know how to build a still and distill alcohol (as Jim suggests)? Manufacture new shot gun shells or crossbow bolts? Turn bread mold into penicillin? You probably can’t learn to do all of these things at a two-week survival camp, but learning just a couple could dramatically improve your odds of prospering (relatively speaking) in the aftermath. This entry was posted on Wednesday, July 30th, 2014 at 9:11 am	and posted in Uncategorized. You can follow any responses to this entry through the RSS 2.0 feed. « Tontines: How Vampires Really Got Rich?